I recently returned home from Spain and the glorious experience of walking the Camino Primitivo – the original way, not only in historic terms – it was the first pilgrimage route to Santiago de Compostela established in the 9th century – but also the route I had intended to follow when first planning the trip to Spain. Just over 300km through some beautiful, remote and sometimes mountainous countryside, from Oviedo to Santiago. A real soul journey. Now after a few days catching up on a backlog of work, I am beginning to focus attention on our next group pilgrimage which begins on August 1st.There are currently 11 of us who will be taking part in the pilgrimage, a mixture of “old timers” who have participated in one or more of our previous trips and new faces. I hope for all it will be a wonderful experience. It is certainly a section of the overall pilgrimage route that I have a special feeling for. Meeting at St Austell railway station we will soon leave the busyness of modern life behind as we walk through a diverse and sometimes surprising landscape including China clay country, parts of a world heritage site, exquisite river valleys and the austere splendour of Bodmin Moor where spirituality and the landscape are so closely entwined. We have some beautiful places to stay on route, a mixture of farmer’s fields and low key campsites. As with our other pilgrimages, we aim to integrate periods of silence with ceremony, sharing in community and seeking to cultivate a deeper connection with ourselves and the earth. There will also be the possibility to swim in the rivers if the weather and water is warm enough. The environment is matched by the rich diversity of sacred sites. 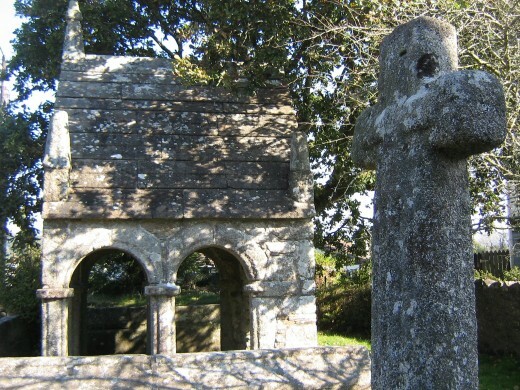 These include ancient stone circles, holy wells, burial chambers and peaceful parish churches along with natural features that in themselves are awe inspiring. One or two more places still available if you feel inclined to join us.